Swimming is a great recreational activity enjoyed by people of all ages, but it’s important to know how to be safe while in the water. The Provincial Disaster Risk Reduction and Management Council (PDRRMC) chaired by Gov. 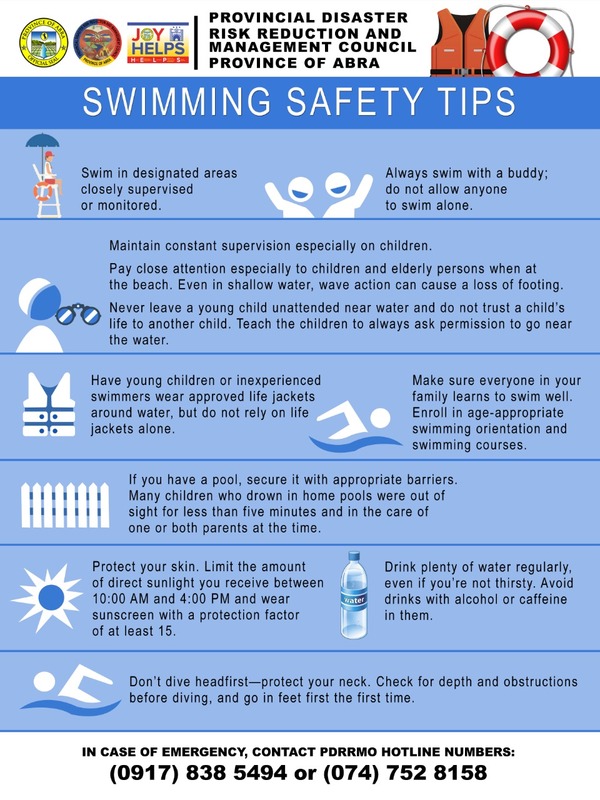 Joy Bernos informs the public of the following important swimming safety tips that people should be aware before heading out to the swimming places. Swim in designated areas closely supervised or monitored. Maintain constant supervision especially on children. Pay close attention especially to children and elderly persons when at the beach. Even in shallow water, wave action can cause a loss of footing. Never leave a young child unattended near water and do not trust a child’s life to another child. Teach the children to always ask permission to go near the water. Have young children or inexperienced swimmers wear approved life jackets around water, but do not rely on life jackets alone. Make sure everyone in your family learns to swim well. Enroll in age-appropriate swimming orientation and swimming courses. Have appropriate equipment, such as reaching or throwing equipment, a cell phone, life jackets, and a first aid kit. Know how and when to call the local emergency number. Protect your skin. Limit the amount of direct sunlight you receive between 10:00 AM and 4:00 PM and wear sunscreen with a protection factor of at least 15. Don’t dive headfirst—protect your neck. Check for depth and obstructions before diving, and go in feet first the first time.